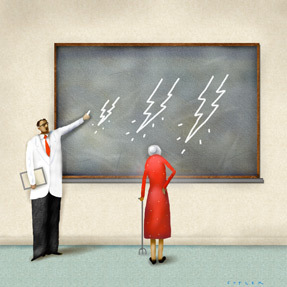 Assessing and managing pain can be complicated in elderly patients. Learn which tools work, which tools don't, and how to optimize treatment. Physicians should consider culture, autonomy and resources before jumping in. Get specifics on access to data, and remember to plan for a possible exit strategy. The Physician Payments Sunshine Act goes into effect Aug. 1. We detail what physicians need to know. EHRs have significant pluses and minuses. A recent week provides a great example of how ACP's Washington office supports College advocacy. Our columnist reflects on his just-completed intern year. The third column in our series describes a patient partner's experience in working toward patient-centered care. The new president of Physicians for a National Health Program, an ACP Fellow, shares his vision for health care reform. This issue includes stories on assessing and managing pain in the elderly, the pros and cons of ACOs, and details on the Physician Payments Sunshine Act. Over the next six to 18 months, ACP will ask randomly chosen members to complete surveys to influence Medicare reimbursement. We outline what members can expect as part of the process. It's important to protect your practice by documenting opioid management in the medical record and adhering to extra regulatory requirements. This regulatory update covers approval of a combined long-term maintenance treatment for chronic obstructive pulmonary disease, warnings against driving after taking insomnia drugs and on use of migraine drugs in pregnant women, and more. Senators and representatives heard directly from ACP members about pressing priorities in health care. ACP Internist's puzzle feature challenges readers to seek answers to clues placed horizontally in rows to reveal an answer written vertically. A 67-year-old woman is evaluated for the abrupt onset of right-sided pleuritic chest pain and moderate dyspnea seemingly triggered by an episode of vigorous coughing during symptoms typical of an upper respiratory infection. She smokes and has COPD. On physical examination, she appears uncomfortable but is not in respiratory distress. Pulmonary examination is significant for a prolonged expiratory phase but no wheeze; breath sounds are symmetrical bilaterally. In addition to hospital admission, what is the most appropriate next step in management?. ACP presented John Tooker Evergreen Awards to seven chapters at Internal Medicine 2013.